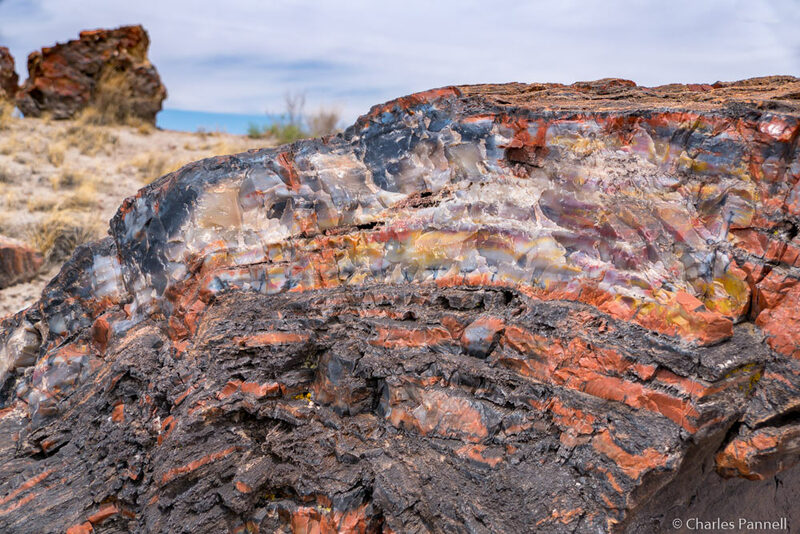 Located about an hour east of Winslow, Petrified Forest National Park (www.nps.gov/pefo) boasts the largest concentration of petrified wood in the world. Not only does this Arizona gem offer some dazzling desert scenery, but it also includes a number of accessible trails and overlooks for wheelchair-users and slow walkers. And since the park is located right off Interstate 40, it’s an excellent addition to any Grand Canyon road trip. It’s easy to do a one-way jaunt through the park, stop at a few trails and attractions along the way, then reconnect to the highway and continue on your journey. If you’re traveling east, take the Highway 180 exit (exit 285) and use the south entrance of the park; and if you’re traveling west, take exit 311 and use the north entrance. Either way, after you’ve explored the 28-mile route, it’s simple to hop back on the interstate. The whole drive takes an hour without any stops, and although there are some wonderful windshield views along the way, there are also some very scenic turnouts and sights that are definitely worth a stop. It should also be noted that the gates to this national park open at 8:00 a.m. and close at 5:00 p.m., so plan accordingly to avoid disappointment. The Painted Desert Visitor Center, which is located near the north entrance, makes a good first stop in the park. Accessible parking is located near the entrance, with level access to the building. Inside there’s a small gift shop, a ranger information desk and accessible restrooms. Pick up a park map, then head out to explore this national treasure. 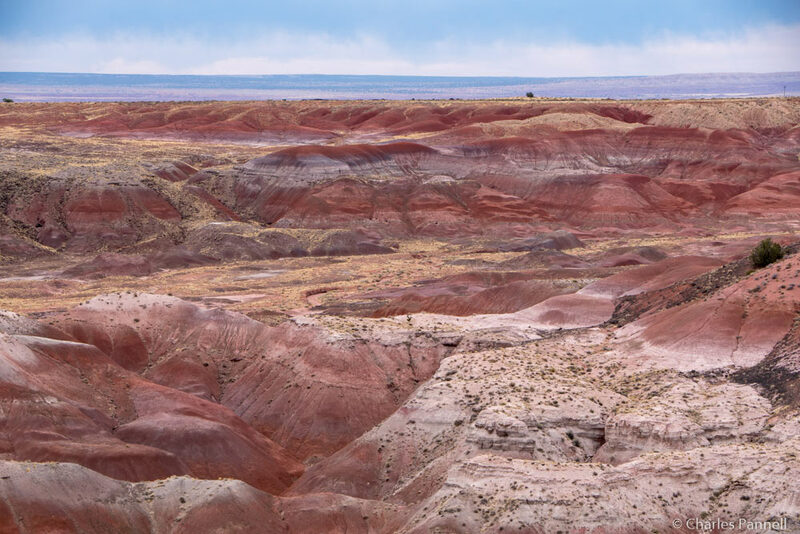 Although there’s no shortage of scenic views in the park, make sure and stop at Tawa Point, just past the north entrance, for that first expansive view of the Painted Desert. Accessible parking is located near curb-cut access up to a short .1-mile paved trail out to the viewpoint. 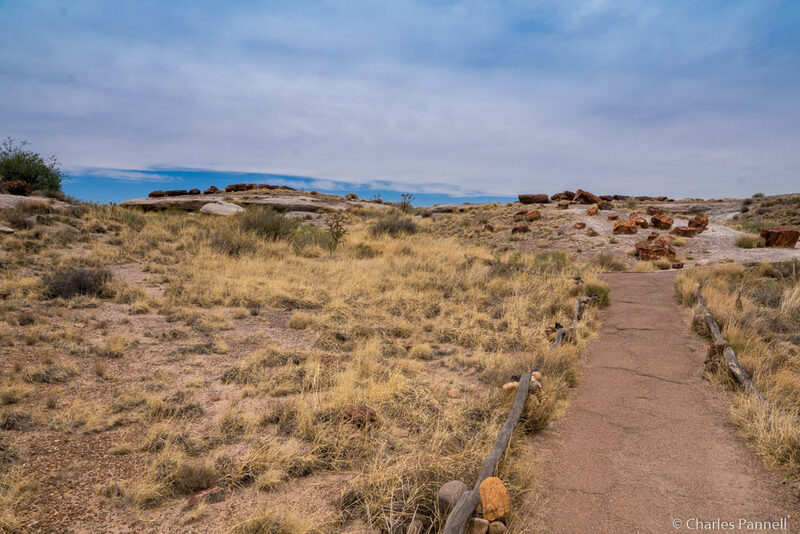 The last 20 feet of this path is a bit steep for manual wheelchair-users; however you can get a good view of the colorful desert from any place along the trail, or even from the parking lot. 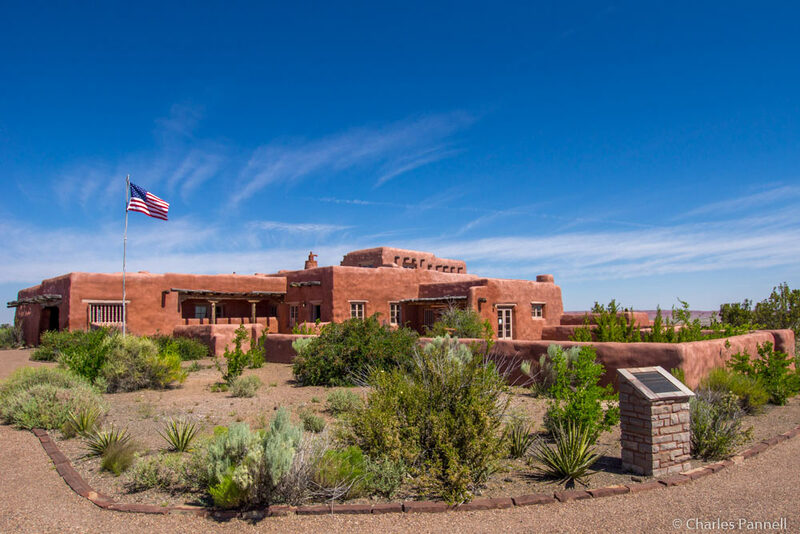 The Painted Desert Inn, which is located just a half-mile up the road, is also worth a stop. This former Harvey House features accessible parking, and level access to the building. There inn houses a number of historic exhibits, but you just can’t beat the panoramic desert view from the second floor of this split-level structure. Additionally, there’s a 300-foot paved level pathway out to nearby Kachina Point, which offers an equally impressive desert view. Another worthwhile stop is Puerco Pueblo, which is a few miles up the road, just past the railroad tracks. Accessible parking with curb-cut access up to the sidewalk is located near the accessible vault toilets. From there it’s about a 200-foot walk out to a .3-mile paved trail that circles the ruins of these ancestral Puebloan homes that were occupied from 1250 to 1380. And don’t miss Newspaper Rock, which is short drive down the road. That site features a 200-foot paved level trail out to some Puebloan petroglyphs, which were created 2,000 years ago. There’s an accessible spotting scope at the overlook, which offers a good view of the 650-plus petroglyphs. There’s also a substantial collection of petrified wood sites — such as the Crystal Forest — along the main park road. 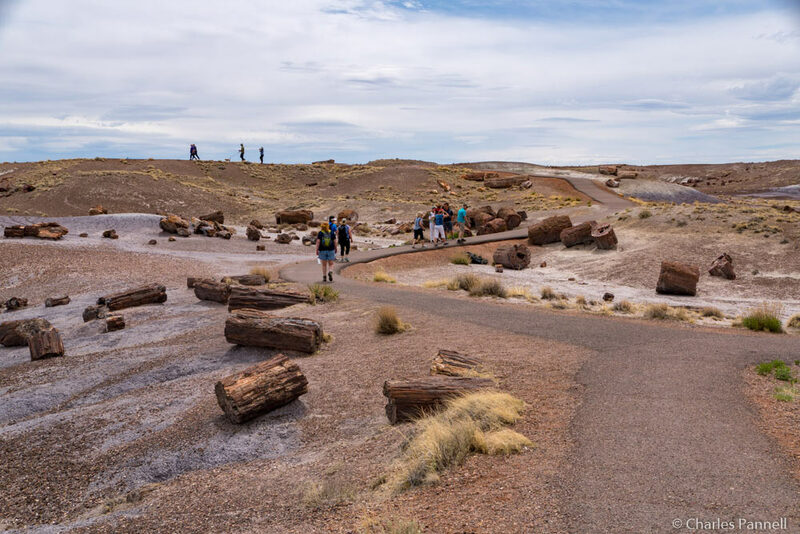 Although a paved .8-mile trail leads past the petrified logs at this site, because of a maximum 20% grade, it’s not a good choice for wheelchair-users and slow walkers. That said there is a 400-foot paved level path that leads out to the trailhead, that offers a good overview of the remains of this ancient forest. Finally, don’t miss the Rainbow Forest, which is located just north of the south entrance. There’s accessible parking near the Rainbow Forest Visitor Center, with ramp access up to the front door. Inside there’s barrier-free access to the interpretive exhibits, ranger information desk and accessible restrooms. There’s also plenty of room for wheelchairs and scooters in the theater, where a movie about the park is shown throughout the day. The Giant Logs Trail is located out back, and although this paved trail starts out level, the access ends 600 feet later at the Mather plaque, where steps block the rest of the route. Still, there’s a good view of the site from this point, or even from the back of the visitor center. And if you’d like to grab a bite to eat before you hit the road, stop in at the curio shop at the far end of the parking lot. There’s level access to the shop, which offers snack items, gifts and souvenirs. All in all, this scenic national park is well worth the short detour off the interstate.